Those old progressions were familiar enough to make us feel at home with new songs and new artists. They’re predictable: the chords, the words and the tunes are different, but the basic shape of the songs is the same, so we can learn them quickly. Some basic forms and variations will continue as they have for many, many years for a simple reason: they work. People have an unconscious desire for symmetry, and the repetition of rhyme, melody and form satisfies that need. The repetition of form also sets up a degree of predictability that’s reassuring and comfortable to a listener. It sets up a solid base on which we can create surprises without taking our audience too far into uncharted territory. The manipulation of form is a very important game to know. Classical musicians learn form as a basic part of their training, and for you, as a popular songwriter, to be able to make conscious choices about form is to be in control of your art. Once you understand the elements of form, what they do and why, you’ll be able to challenge yourself to go beyond the familiar as you write your own songs. a. The lyric, from verse to verse, is different or contains substantial new information each time. It may contain elements of previous verses (such as the title line if the song has no chorus). b. The melody is essentially the same each time we hear it, although there is room for variation and some flexibility to accommodate the lyric. The reason for keeping the melody the same is because that familiarity makes it easier for the listener to focus on the changing lyric. a. The melody is the same each time we hear it. b. The song’s title usually appears in the first and/or last line, and possibly more. c. The lyric is usually the same each time, although you may want to use some new lyric information in subsequent choruses to develop the story. A good example of that would be a “turnaround”: a tactic commonly used in country music, where the “twist” is not revealed until the last chorus. An example of a song with a chorus that changes every time but still works well is Blessid Union of Souls’ “I Wanna Be There.” It has an eight-line chorus that repeats the title at the beginning of lines 1, 2, 4, 5 and 8, with the rest of the chorus lyric changing in every verse. A title repeated that many times guarantees that a listener has something to sing along with, and can easily learn. It also allows the writers to change other information in the chorus without worrying about losing their listeners. 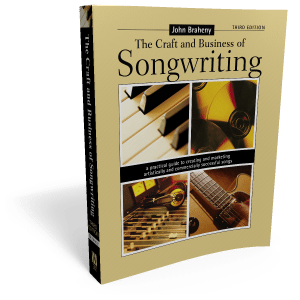 Even though there may be reasons for you to change the lyric, there is a very practical reason for you to keep at least a substantial part of it the same: you want listeners to learn your song quickly and easily. If they hear the same chorus three times during the song, they can go away singing it. If you change all or even some of the lyric and music on each chorus, you make it harder for the listener to remember. If you have information in the verses that you want people to think about, the chorus should let a listener relax with its simplicity to allow the verse information to sink in. Be aware that, in a song, the listener’s attention is divided between the lyric and the music, making it extra important to retain simplicity. So even when you feel you need to change the chorus lyric, a substantial amount of it – particularly the title line – should remain the same and be repeated every time. Also called a “release” or “break,” the bridge provides a variety of important functions in a song. Musically, it helps to relieve the “boredom factor,” and for that reason, it’s usually placed about 2/3 of the way into the song, (After the second chorus in a verse/chorus form) which is normally when people may begin to tire of melodic repetition. The bridge zaps the listener back to attention and helps them to refocus on the song, and can add drama in many other ways. Musically, you can use any of the devices used to achieve contrast described in the “Song Dynamics” segment that we’ll get to later. a. Its melody is different from the verse and the chorus, although occasionally a portion of the verse or chorus melody may be used in the bridge. b. It usually doesn’t contain the title and/or hook, but that’s certainly not the law. That decision may depend on how many times you have repeated the title/hook in the song. If you haven’t done it much, it might be smart to use it again. 2) if it is constructed correctly, its melody leads back into the verse or chorus. d. It is rarely over eight bars long. After all, it’s supposed to be a diversion, not a whole piece in itself. It may be two bars or two lines or whatever is needed to fulfill the function of breaking up the song. e. It is entirely optional. Pre-choruses are melodic segments that are different from the verses, chorus or bridge. They are known by many other names (climb, lift, channel, B-section, pre-hook, setup), all of which give you clues about their function. They’re used extensively in contemporary music – primarily in pop and R&B – although they’re currently gaining popularity in country/pop. Producers seem to favor pre-choruses to help create an additional level of interest to keep a song exciting, particularly in up-tempo or dance songs where extra length and faster tempo make a straight verse/chorus form feel too repetitive. a. They directly precede the chorus. b. They usually precede each chorus, but may be dropped after the first couple of times if you can find a way (musically) to get back to the chorus without it. c. Lyrics can be the same each time or different. Melodies are the same each time. d. The length varies, like the bridge, from one line to four. Pre-choruses usually last no longer than eight bars. e. Musically, they build tension to increase the feeling of release in the chorus.